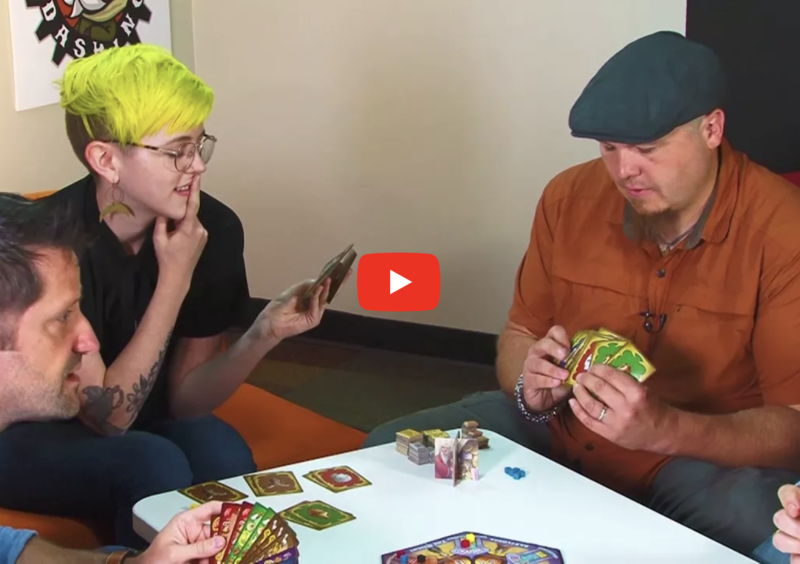 You’ve seen our How to Play video, you’ve read about epic trades, and watched the Art of the Trade highlight reel… but you’re still curious to see how Hafid’s Grand Bazaar plays through all the phases and rounds with actual players. Good news! We’re here to satisfy that curiosity with our Full Play Through video with Tim, Leah, Mike, and Grant. Navigate the four phases of each round of play alongside our ambitious merchants. In this video they are playing four rounds, one for each player to have the opportunity to begin bidding first. Hafid’s Grand Bazaar can be played with 2-6 players and makes for a great game night and family night game. Available now at your Friendly Local Game Store and on our webstore. 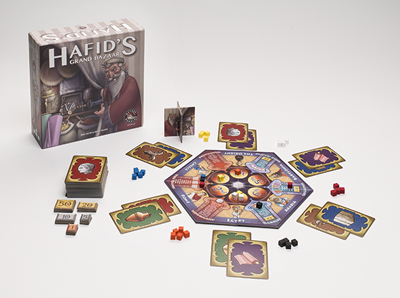 Hafid’s Grand Bazaar hit store shelves earlier this month and has received some high praise among reviewers. Over at A Pawn’s Perspective, Rob Kalajian was impressed, despite his normal dislike for bidding games! The highly social aspect of this game was not lost on Paste Magazine’s Keith Law, landing Hafid’s Grand Bazaar in their list of Best Games from Gen Con 2017! “Hafid’s [Grand Bazaar] has a big negotiation component on top of its set collection mechanic that makes this a much more social game than all of the others of its ilk, like adding Go Fish to a multi-player Jaipur,” he wrote. Hafid’s Grand Bazaar is available at your Friendly Local Game Store and through our website. Check out How to Play videos, Play Throughs, and more on the game page for Hafid’s Grand Bazaar. We are very excited to announce that Rather Dashing Games will be represented at Essen Spiel this year by BNW Distribution! Attendees will be able to purchase a limited supply of Element, Hafid’s Grand Bazaar, and This Belongs in a Museum (English language versions) at booth 6B127 with BraveNewWorld. If you will be at the show this year we’d love to see your pictures from the show, so please tag Rather Dashing Games in your relevant posts! We look forward to bringing these games (and future titles) to the European gaming market with partners like BNW.